Provide comfort for the family of Michael John "Mike" Maher with a meaningful gesture of sympathy. Peacefully passed away at the Peterborough Regional Health Centre on Thursday, April 4, 2019 with his family by his side, at the age of 82. Beloved husband of Anne Maher (nee McBride) for 59 years. Much loved dad of Michelle and predeceased by infant son Cameron Michael (1966). Predeceased by his sister Patricia Craig. Brother-in-law of Gregory McBride and Mildred (Bob) Lafleche. Fondly remembered by his nieces, nephews, family and friends. 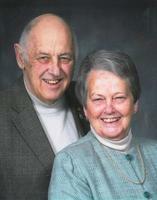 Friends are invited to visit the family at the Gordon A. Monk Funeral Home Ltd., 127 Bobcaygeon Rd., P.O. Box 427, Minden K0M 2K0 on Monday from 2-4 and 6-8 pm. Funeral Mass at Our Lady of Fatima Catholic Church, 7 Bobcaygeon Rd., Minden on Tuesday, April 9, 2019 at 11:00 am. Spring Interment at St. Patrick’s Catholic Cemetery, Kinmount. Memorial Donations to the Minden Health Care Auxiliary or to the Peterborough Regional Health Centre Foundation would be appreciated by the family. Reception to follow Mass in the Church Hall. We encourage you to share your most beloved memories of Michael John "Mike" Maher here, so that the family and other loved ones can always see it. You can upload cherished photographs, or share your favorite stories, and can even comment on those shared by others. So sorry to hear of your loss Anne. I know what you are experiencing right now and I am sure Michelle and family are by your side through this difficult time. Wishing you good days ahead. Dear Anne and Michelle, I am sorry for your loss. You are in my thoughts.